Here are some pictures from the lovely little midlands country town of Ross where we spent a few hours yesterday. 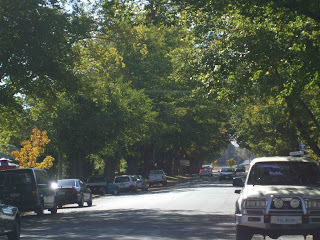 It's tree lined main street is gorgeous this time of the year. There are lovely little cottages like this which are either B & B's or antique type shops. Lots of Old Wares Shops. 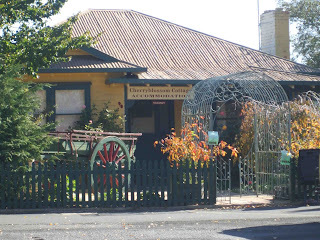 It really is worth a stop if you ever travel the midlands highway here in Tasmania. There are a lot of little communities just like this one. Another little town is Kempton. We stopped in to a little market there and this is what I found..... My very own treasure chest. 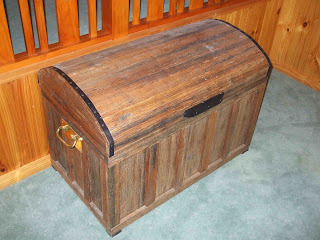 It is made from recycled timbers with brass handles and it is just gorgeous. I love everything about it and just had to bring it home. I couldn't even help DH into the car with it because it is just so heavy. And now here is an update on my little shop. 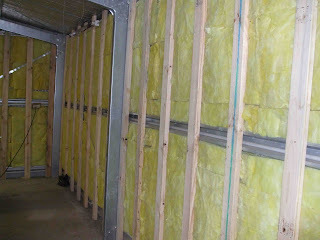 Here are the walls before being cladded. We decided to have them insulated even though we have installed a reverse cycle heat pump because it gets pretty cold here in winter. 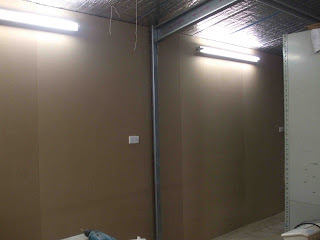 Here are the walls with their covering. My project over the next few weeks will be to paint and decorate. Any ideas on the best colour to paint a shop? I hope that you have enjoyed your little trip around Ross and seeing my treasure. Just 2 more posts until my giveaway. The shop venture is so exciting. 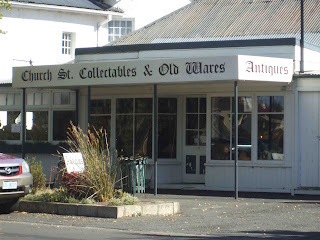 We have some wonderful country towns, and the bric-a-brac & antiques are enticing. I love your chest, what a great buy. As for the colour, I'd think something fairly neutral would work best. Looks like Ross is my kind of town. Love to look around and visit them. Your party in your last post looked like so much fun and what a great celebration. The color for the shop may be boring but a white or neutral is what I would go with. That way any color of fabric or project just fits in. So glad it's coming along for you. LOVE the chest. What kind of shop are you opening? I wish we had beautiful shops like those here. Neutral colours are good for the walls but whites and creams get really really dirty - surprisingly quickly for a fabric shop too. It also makes the hooks stand out. Using an effect like ragging may reduce this though. Blue is a good colour as it will go with anything (try it with your fabrics). I have many happy memories of visiting Ross a couple of years ago. We actually called in twice we loved it so much. I remember visiting an open garden in the main street. I loved the intersection further up the end with the war memorial and the lovely old buildings on each corner. As far as the paint colours go something plain I know if you have artwork to display you usually have white walls for the subjects to show up. Unless of course you have a theme in mind. Choose something that you can live with that is peaceful and relaxing after all you are going to be spending a fair amount of time there. Good luck with the colour charts maybe some sample pots to splash about first to see what takes your fancy. Love the chest and all the lovely photos . The shop is really coming along you must be so excited . Ross looks so lovely...almost olde-world, just beautiful! Good luck with your shop. How VERY exciting!!! 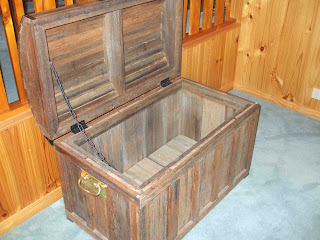 Hi Fiona,back on line at last!hope you got my email.love the treasure chest,and Ross looks beautiful,love to come across a place like that. Must be exciting now it is all happening with your shop,I think I would keep it neutral,get lots of tester pots,best wishes,Pam. I can see why you HAD to have that chest... it is gorgeous!! What are you going to put in it?? Your shop is coming along great Fiona.... as for paint, I have always loved apple green and white with timber! SO YUMMY!! I look forward to seeing what you come up with. Its coming along. How exciting for you. I admire your courage to take the plunge. You will do very well in your little shop. Thanks for the tour around Ross...have been there and brought back nice memories!!! Boring answer from me I guess but a neutral will help show of your wares - maybe you could have a feature wall behind the counter to break it up a bit??? I love this trunk, you are very lucky! And for colors? Personally I would go for something light and friendly, like ecru or maybe a few different lights. So you can change the shop easily in the mood colors you feel like without having to paint again and again!